Blackbird porcupine lived in a “zoo” located inside a mall, along with wolves, bears, coyotes, and lots of other wildlife. When the “zoo” closed in 2015, the Animal Rescue League of Iowa (ARL) stepped in to rescue some of the animals. ARL approached Southwest Wildlife to see if we could take some of the smaller mammals. We agreed. As a result, Ricky raccoon, Arnie the armadillo, Piglet the opossum and Blackbird all found a home for life at our sanctuary. We know nothing about Blackbird’s background. She has always been very shy and shutdown when people are around. 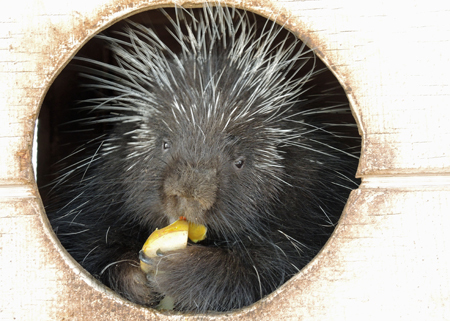 Blackbird was housed by herself when she first arrived, but now lives with the other porcupines in an outdoor enclosure. It seems like they’re getting along, so our fingers are crossed that this will work for her. We hope one of these days she'll realize that she's safe and that her life now includes plenty of pecans – her favorite.